Composting is an easy and very cost-effective way of making organic fertilizers for your garden plants. If your want to maintain your plants to be healthy and beautiful but you do not have enough money to spare for a bag of fertilizer then composting is the way to go. Making compost can be done either outside the house or outside. Many have a vague idea that composting is a messy business. Composting does not have to be messy at all even when you do it outdoors. You can make use of a closed plastic or rubber bin as a compost bin. The closed plastic or rubber bin is basically a compost bin designed for outdoor use so you can’t really use this inside your house. This type of compost bin is actually very easy to make and the materials that you will need are very cheap. Some of the things you might use can even come for free right within your homes. The things needed in order to get started in making a closed plastic rubber or compost bin are the following: a large plastic barrel or a rubber bin or trash can that has a tight-fitting screw on lid, hardware cloth, screws and nails. The size of the bin is dependent upon the volume of compost you are planning to make. If you have a big garden to fertilize, then it would be best to go all the way and get a large plastic or rubber bin. On making the compost bin, the first thing you have to do is to cut off the bottom of the plastic or rubber bin that you will be using. Get the hardware cloth and cut a piece that could cover the bottom of the plastic or rubber bin. To make sure that the clothe you cut out is exactly the right size to cover the bottom of your bin, use the part that your just cut off from the bottom of the bin as a pattern. Make some allowance and attach that piece of hardware cloth to the bottom of the compost bin with the use of nails or screws. 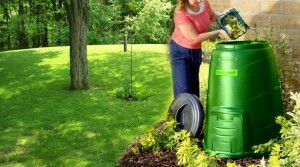 Find a spot in your yard outside to place your compost bin. Designate this as the composting area. After choosing a spot, you should dig a hole that is around 4 inches in depth and with a diameter as bid as the bottom of the compost bin. Fit the bottom part of the compost bin in the hole you just dug. You compost bin should be ready for use. The things that could go on inside the bin for composting to jumpstart the whole process are some potting soil, biodegradable wastes such as paper, leaves, fruit peelings and kitchen wastes. After placing all the stuff to be composed, remember to put the lid back on and secure it tightly. Heat that builds up inside the compost bin should breakdown the stuff you just put in. Furthermore, keeping the lid on prevents stray animals from digging through your compost and creating a mess.